Book launch at The Museum Of Country Life. Co. Author Richard Gillespie and Dr. Ciaran O Conor who launched the book. 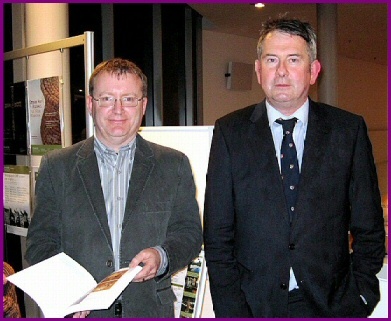 Pictured at the launch of "Of Troughs and Tuyeres - The Archaeology of the N5 Charlestown Bypass" is co-author (on left) Richard Gillespie and Dr. Ciaran O'Conor, Archaeology Dept., NUIGalway., who launched the publication at a well attended function in The Museum of Country Life. Turlough. Ms. Agnes Kerrigan, co-author was unavoidably absent. This beautifully presented book is published by the National Roads Authority and it gives a most interesting account of the excavations which took place along the route of the Charlestown Bypass during its construction. The book contains many photographs and drawings of the excavated sites, and of the many amazing artefacts found there - these include gold filigree, tanged and barbed arrowheads, scrapers, beads, and other unusual pieces, some of which are now on display in a temporary exhibition at the Museum of Country Life. It is well worth a visit to the museum to view this unique showing of such an important part of Co. Mayo's heritage and culture.